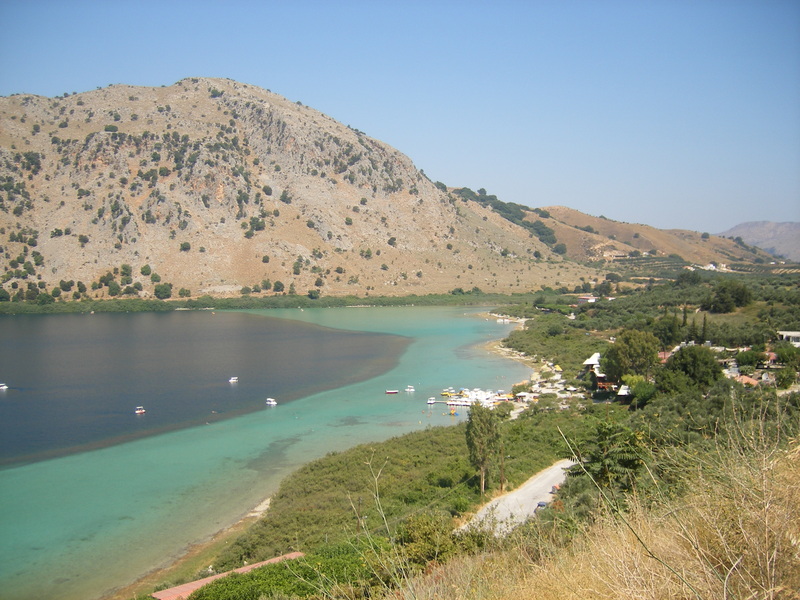 Surrounded by mountains, Lake Kournas is Crete's only freshwater lake. Take a walk around the 3.5 km (2.2 mi) perimeter to look for some marine life. The lake is a protected wetland, home to ducks, eels, water snakes, and diamondback terrapin. Visits from herons and cormorants also make bird-watching a popular activity here. Soak up some sun, take a swim, or rent a paddleboat to explore the lake. If you're hungry, try some traditional Cretan specialities from one of the tavernas lining the lake. 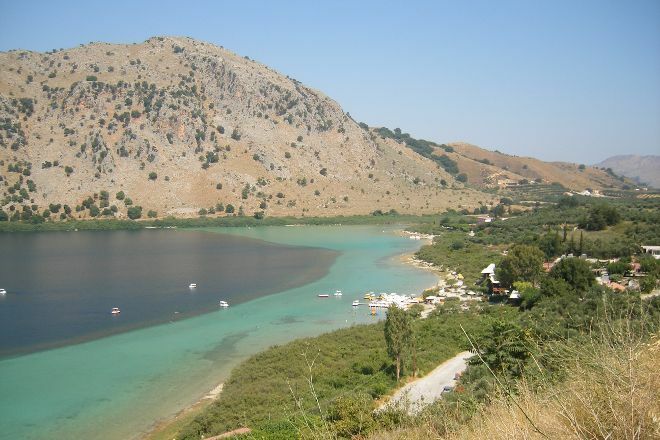 To visit Lake Kournas on your trip to Kournas, use our Kournas route planning tool . A very beautiful Lake. After salty sea swim in the water absolutely ... and yet it is necessary to take a catamaran ride on the Lake, enjoy the deep Emerald color, nature around. And, if you're lucky, see bug. We went with the fun train to the Lake Kournas on Georgioupoli. The journey by train is adventurous. Arrived at the Lake we rented a pedal boat us and went looking for a turtle; We saw 3. Beautiful excursion destination for the whole family. Cute little lake where you can rent pedal boats, for a pleasant ride of an hour or so. Also present were chairs, a few restaurants/bar overlooking the Lake and many souvenir shops. Such a beautiful place to visit. The natural landscape is magical. You can enjoy the views of the lake from high up or even walk to the bottom of the hills and rent a boat. Easy access from the main road just a few minutes from the highway. Definitely a place to visit for great pictures all year long. Amazing beauty! Unfortunately stony beach. But great for family day of paddle boats and turtles and fish watching. No public toilets. To many shops and taverns, and no wild natural site by the lake left for peaceful rest. If you would like to eat something nice - go by car uphill, beter view and much better local food. Worth visiting. Rent a pedal boat and go for a search of turtles. I guess not so many left or every single one is hiding. The lake view is beautiful, pedal boat enables you to see turtles in the water and wild goats on the rocks. Due to heavy rain that started we could not enjoy it longer than an hour, so finalized our trip with the recommended local cuisine at Georgias Taverna with the view on the mountains under the storm. Every day, we help thousands of travelers plan great vacations. Here are some tips on how to use your Listing Page to attract more travelers to your business - Lake Kournas. Promote your permanent link - https://www.inspirock.com/greece/kournas/lake-kournas-a766706265 - on your website, your blog, and social media. When a traveler builds a plan from this page, the itinerary automatically includes Lake Kournas. This is a great way for travelers looking for a great vacation in your city or country to also experience Lake Kournas. Promoting your link also lets your audience know that you are featured on a rapidly growing travel site. In addition, the more this page is used, the more we will promote Lake Kournas to other Inspirock users. For best results, use the customized Trip Planning Widget for Lake Kournas on your website. It has all the advantages mentioned above, plus users to your site can conveniently access it directly on your site. Visitors to your site will appreciate you offering them help with planning their vacation. Setting this up takes just a few minutes - Click here for instructions.